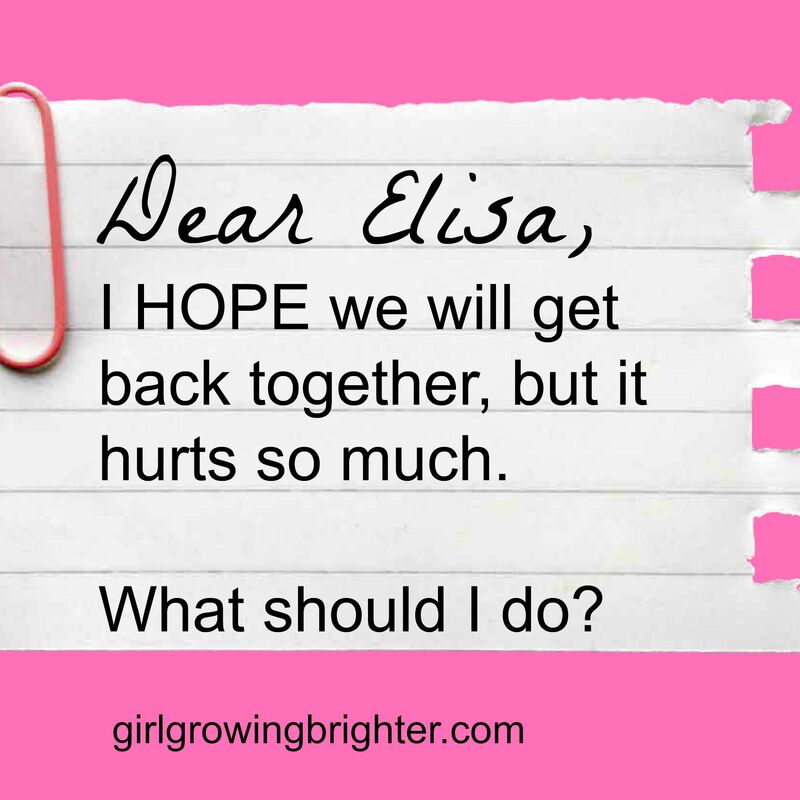 Dear Elisa: I HOPE we’ll get back together, but it hurts so much. What should I do? …The guy I love asked me for my keys back just two days ago. I am heart broken. Sadly, he’s acquired an addiction in the last several months, and I have been unable to stop nagging him about it. (For good reason, I know, but nagging is a relationship killer). I’m so hurt, and I am so worried about him, but he doesn’t see yet that he has a problem. To him, he’s just doing what he wants, having fun. We’d been planning for the future, and he was closer and more in love with me than he ever has been with anyone, ever. I’m sad for me, but I am also sad for him, and what he’s losing. I regret nagging him- I know now that that never helps, just drives people away. I guess my issue now is The Hope. We’ve broken up and gotten back together before, because he realizes he misses, loves, and can’t live without me. (If he sounds immature, it’s because in relationships, he is, but he’s wonderful, and treats me extremely well, other than occasionally freaking out, and breaking up with me.) I don’t know what I need to hear…… I really love the bugger- he’s my best friend. Any words are appreciated- I hurt so much right now. I wrote him a letter apologizing g for the constant nagging and sideways remarks in front of his friends, but I haven’t sent it, or anything else. I’m so sorry to hear about your heartbreak. You feel hurt and sad, and you are blaming yourself. You were trying to show you cared, but ended up nagging him, or even worse, “mothering” him. He probably felt that if you cared about him, you’d respect his choices. We live and learn; please forgive yourself. 2. What is YOUR bottom line? Let’s assume he might never change this behavior – because he might not. Could you live with it? If his addiction continued forever, would you be better off with or without him? Answer these as un-sentimentally as possible. Leave your heart out of your answers. Your answers are your peace. This way, if you ever choose to get back with your ex, you’ll be making a fully-conscious choice, and therefore will be more accepting. If you move on, you will have a stronger idea of what you seek in your True Love. If you TRULY respect your ex’s ability to make decisions, you must respect his decision to break up with you as “legit.” Whether or not he consciously means it, breaking up with you over-and-over is a way to assert power in the relationship so that he feels he is in control. This means he may never get back together with you, or he may. Ultimately your job is to answer Questions #1 and #2 for yourself, FIRST. BEFORE you try to get back with him. Meanwhile, what can you do to ease the pain for yourself? Let’s assume that your letter will not change him in any way. In that case, what are the final things you would want him to know? What words will bring YOU peace? That is the letter I’d recommend writing. You don’t need to send it, unless you know it will make you feel better. One day, you will look back on this breakup and see it as a gift in disguise. Use this time to think about who you are, what you want, and the qualities you want in a relationship. I promise you, one day you’ll be at a restaurant with someone you love, celebrating your 10th (20th, 30th) anniversary, laughing and looking back, realizing how much you’ve grown. I promise. PS: *** Placing other people’s needs above your own & not being able to recognize your own is codependent behavior. Most “giving people” have trouble with not care-taking for their loved ones; it’s tempting…….but remember, you are not anyone’s mother! I recommend the book “Codependent No More” — it’s a fast and interesting read. XO. PPS: This is pulled from the comments section of this post, with slight improvements to my reply.